Author(s): Khairunnisa Abdul Ghaffar, Ashwini Kumar Giddam, Mehfuz Zaman, Mariusz Skwarczynski, Istvan Toth. School of Chemistry & Molecular Biosciences, University of Queensland, Chemistry Blg #68 St. Lucia, Queensland 4072, Australia. Since the discovery of liposomes by Alec Bangham in mid-1960s, these phospholipid vesicles have been widely used as pharmaceutical carriers. Liposomes have been extensively studied in the vaccine delivery field as a carrier and an immune stimulating agent. Liposomes are usually formulated as nanoparticles, mimicking the properties of pathogens, and have the ability to induce humoral and cell-mediated immune responses. In this review, we focused on modern nanotechnology-based approaches for the improvement of liposomal vaccine delivery systems. Topics such as sizedependent uptake, processing and activation of antigen presenting cells, targeting liposomes and route of administration are discussed. Keywords: Administration route, bilosome, liposome, niosome, size-dependent immunity, vaccine delivery, virosome. Affiliation:School of Chemistry & Molecular Biosciences, University of Queensland, Chemistry Blg #68 St. Lucia, Queensland 4072, Australia. Keywords:Administration route, bilosome, liposome, niosome, size-dependent immunity, vaccine delivery, virosome. Abstract:Since the discovery of liposomes by Alec Bangham in mid-1960s, these phospholipid vesicles have been widely used as pharmaceutical carriers. 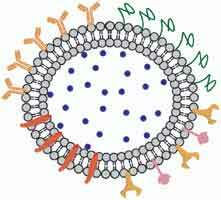 Liposomes have been extensively studied in the vaccine delivery field as a carrier and an immune stimulating agent. Liposomes are usually formulated as nanoparticles, mimicking the properties of pathogens, and have the ability to induce humoral and cell-mediated immune responses. In this review, we focused on modern nanotechnology-based approaches for the improvement of liposomal vaccine delivery systems. Topics such as sizedependent uptake, processing and activation of antigen presenting cells, targeting liposomes and route of administration are discussed.